Terry Bozzio is the drummer with no doubt the richest drum set in all the history of the drumset (24 tuned toms, more than ten pedals and 40 cymbals) if we consider a single seat to play. 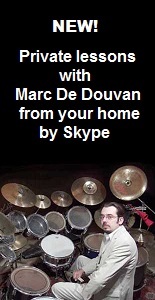 Coming from the fusion style (he become himself well-known with the great Frank Zappa (who wrote the "Black Page", a composition for solo drummer, specially conceived for him) in 1975 at 25 years old, and the Brecker brothers in 1978) very versatile (as well comfortable in jazz as Latin) he plays now in solo or with metal musicians, with an impressive feet independence, which play complex ostinatos (pataflas, etc.) while the hands improvise melodically (with arpeggiated playings which he is the precursor) on tuned toms and Chinese cymbals (specially made on his command). 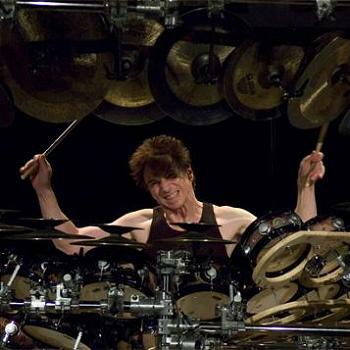 There are very pioneering scores and instructional videos of Terry Bozzio, which expose these new concepts which raise the instrument to highs difficult to exceed and taken up by the modern drummers yet known as the most innovative currently like Thomas Lang , Mike Portnoy or Marco Minnemann (it gives an idea of his importance and genius).